My lovely cousin A. is 8 weeks in to her Trish McEvoy Lash Enhancer challenge! Let me refer you lovely people to this post for the background info. I’m a week early on the photo because she’s on holiday this week… but I thought it was worth taking anyway and my next update will be at the 12 week stage, by which time… results should be fully apparent according to the blurb with the product. Two months in means that she’s halfway through the £89 tube. It’s on a par price-wise with other lash-enhancing products on the market, but backed by the reputable name of Trish McEvoy. A. 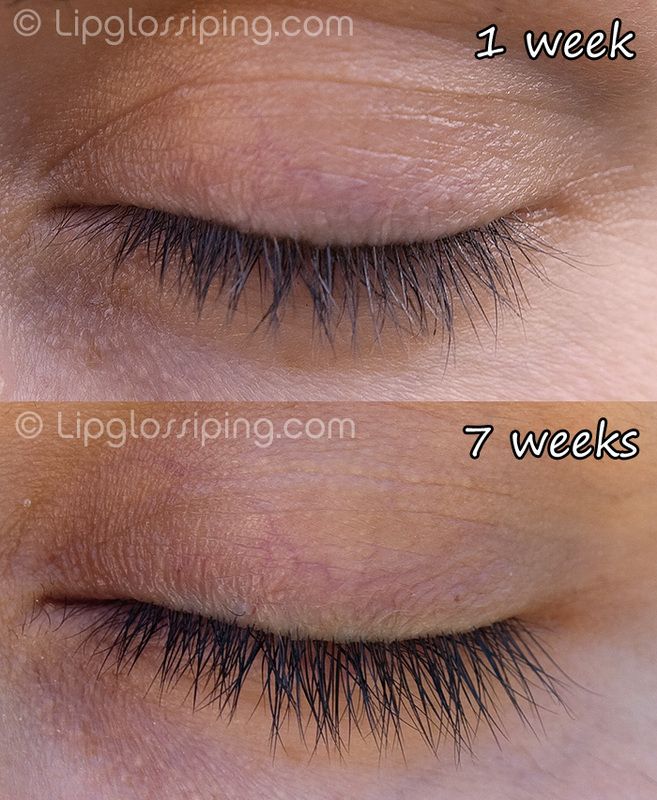 (who hasn’t seen these photos) believes that she’s experienced a change in the volume of her lashes… to her, they feel thicker and more luxurious. She doesn’t believe that her lashes have grown in length though. Giddyup lashes! Week 12 awaits! What do you ladies reckon judging by the photos? Yes, I go along with karleigh. They look darker. That’s all. I’d just spend it on a good mascara. I see a very subtle difference between the two pics, barely any really though and certainly nothing to justify the ridiculous price tag. In fact on closer examination I’d go so far as to say that the lashes on the right side of the photos look longer, but slightly finer. Stupid me. I meant look longer, but slightly finer in the BEFORE pic. They look darker, but I’m sure it’s just to do with the lighting. Otherwise, no difference at all. Sorry A. There are new freckles and a short rogue lash higher than the rest at one third from the corner though! because of the difference in lighting- her skin is darker too. If I notice anything, it’s perhaps the length, but since your eye lashes cycle in growth, that could just as well be due to the timing and not the lash enhancer. Even if it is the product, the small difference I can see so far doesn’t justify the price- can’t wait to see the next round of pics! Slightly darker (guessing it’s lighting) and maybe just a teeny bit longer? They look healthier, condtioned, darker and a tad fuller. it’s a bit pricy for conditioning the lashes! The lshes just look darker & thicker to me. No lash dyeing shenanigans promise, so it must be the lighting. I think the 1st photo was a sunny day (which may have washed the lashes out a bit). It’s really interesting to read the different views on the same picture. To me… I *think* I see more lashes in the 2nd photo. Personally, not enough to spend £89 on… but I’m sure I see a slight difference in quantity/thickness? It’s most noticeable in the outer 1/3 portion. Anyway, I won’t pass final judgement for another 5 weeks… but interestingggg! And I’m not telling her what you mean lot said, she’s loving it! good on your cousin for being a guinea pig though!